A blank list of resolutions for new year or in general pinned to a cork notice board with room for your text. The new year is a time that entrepreneurs look forward to. They get to wipe the slate clean and start the year with a fresh vision, strong goals and aspirations and a drive to do the impossible. It's an opportunity to get off the "entrepreneur roller coaster," as coined by author Darren Hardy, and have a glimpse into life as a successful and stable business owner. That, my fellow entrepreneurs, encompasses January 1 through to the 3. After that, there is a strong possibility that you will find yourself back on the roller coaster. Dealing with the same fires that you were dealing with prior to the holidays, the same complaints, the same energy sucking situations that drove you to enjoy each and every cocktail offered over the holiday season. What can we as entrepreneurs do to ensure that that we don't fall into the same routine which led us to this roller coaster in the first place? 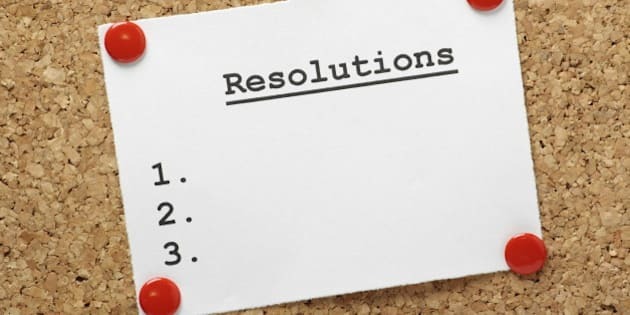 1) Create Four Big Goals for the Year. Don't decide your goal is to quadruple sales in January. Set attainable goals with realistic outcomes. Set one goal per quarter and make that goal something that will help drive your business forward and add a new value. Ensure that those goals have a way of being measured. Whether it's the hiring of a key role or a new product that you are hoping to develop, these overarching goals give you something to focus on when you might otherwise be scrolling through someone's Facebook wall. 2) Break Down Goals into Bite-Sized Pieces. Let's assume one of your goals is the hiring of a key person. That step can be overwhelming, so break it down into a series of small steps that can be accomplished over a short period of time. Schedule daily time when you will review applicants and set up interviews. Broken down, the tasks seem very manageable and can be spread out over several days to ensure you don't get overwhelmed. See the new year as an opportunity to remember why you became an entrepreneur in the first place. We all have a routine. Get to the office, check email, put out fires, make lists of things to do that don't actually make us feel like we have accomplished anything. I like to refer to routines as ruts. These are things we do every day, in the same order, day after day. No wonder we lose motivation! How can you possibly do the exact same thing everyday and stay motivated? Challenge yourself to do one thing differently per week. Try ignoring emails until 10 a.m. or commit to making sales calls before the office day has officially started. Wake up at 5 a.m. and exercise, take daily walk breaks. Do whatever it takes to change up your routine and stay energized and motivated. 4) Create a Vision Board. I know it sounds hokey, but it helps and it certainly can't hurt. As an entrepreneur, I have a vision for whom I want to be and what I want to accomplish, but on certain days it's hard to see past the chaos of the roller coaster. Commit to creating a vision board. It does not have to be an artistic masterpiece. It simply has to be filled with things that make your heart race a bit faster and you energize you. From success stories, to visuals of the future you dream of, stick it on the board! There are even great websites that let you add pictures of yourself to magazine covers which make for fantastic inspirations. I've added myself to the cover of Fortune magazine for my one my visuals for the year... you never know, crazier things have happened! See the new year as an opportunity to remember why you became an entrepreneur in the first place. While it's a difficult, challenging, mentally exhausting and stressful life choice, it's also the opportunity to prove just how incredible your business idea is. Put everything you've got into it because if you don't do it, there's always a competitor out there willing to take on the challenge.